The tree was struck by lightning Tuesday evening and destroyed the counselors' cabin at Camp Hinds. Camp Hinds supporters have started a campaign to raise $11,000 to rebuild Boone Manor. 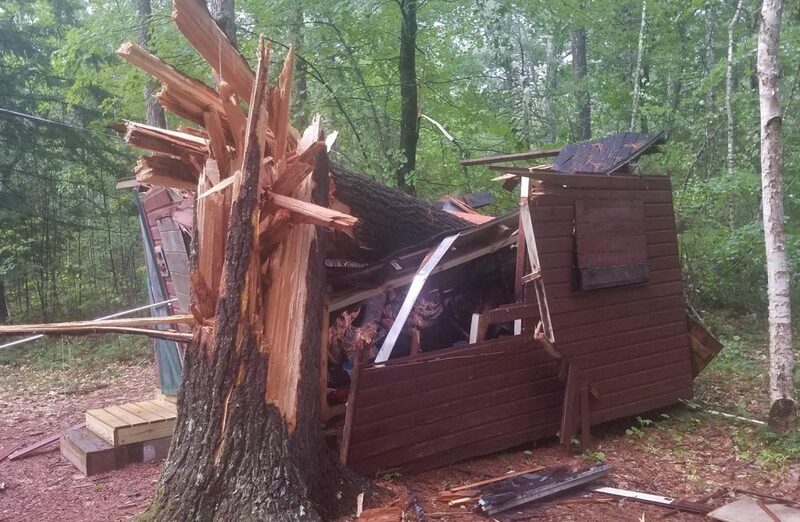 A powerful thunderstorm tore through a Boy Scout camp Tuesday evening, destroying a cabin used to house camp counselors. Lightning struck a tree, which fell on a staff cabin known as Boone Manor, Camp Hinds said on its Facebook page. The wood-framed structure was crushed, but the counselors were not inside at the time. Camp Hinds supporters have started a campaign to raise $11,000 to rebuild Boone Manor. The GoFundMe campaign, as of Wednesday night, had raised close to $1,000. The Pine Tree Council, Boy Scouts of America, owns and operates Camp Hinds, which is located on more than 300 acres of land on Panther Pond. The camp was founded in1927.